I’m so pleased to be able to welcome you as my guest at Tea and Talk at Sally Lunns. Hi Jo ~ it’s such fun to be here. I’ll have milk in my tea, seeing as that it’s the afternoon, and sugar please. Make it two. No really, go on. Yes, two. TWO. Ah, thank you. I know, people are always surprised, but I’m a sweetheart ~ I need my sugar. Now I know you grew up in Germany but can you tell us a little more about yourself? In earnest, I started writing eight years ago when I was pregnant. I’d quit my job and I was determined to fulfil my lifetime’s ambition of writing a book. I followed through, too, completing the first draft in about three months and editing it in various stages over the following years. However, it’s only since my younger son started school that I suddenly had this mad desire to turn writing into a proper career, and that’s about two years ago. What inspired you to write a book that featured a rock band? What can I say? I have a thing about rock stars. Always have done, presumably always will do. It’s something about the voices and the hair and that powerful on-stage presence that makes me go quite weak without fail. So I spun a fantasy around what would happen if…someone like Mr. Bon Jovi ever proposed. I hasten to add that the book is NOT about Mr. BJ, has nothing to do with him, in fact, and isn’t even inspired by him…directly. It was just…you know…a daydream which grew into a book. When did you decide Sophie’s journey was not yet at an end and there were another two books to be written? That’s a really good question. I didn’t, to begin with. I wrote it as one book, called ‘Full Circle’ at the time (owing to the ending, you see) and left it there. Obviously I knew the story wasn’t finished and the epilogue kind of opened the way into a second book right away, but I didn’t start thinking about writing this second book until I had published the first one. When I planned the second book, it turned out that Sophie’s story was far more complex than I had envisaged and I couldn’t possibly fit it all into one book. So then I swiftly planned two more books, one in great detail (Sophie’s Run) and one in outline (Sophie’s Encore). Did you work out the plot for both remaining stories at the same time? Lol ~ I should have read ahead, shouldn’t I! I think I answered that question above. That’s me, always chatting away, offering way too much information. Now to music, I know you and I both share a love of rock music but who are your favourite bands? How long have you got? Europe, THE HUSH, Dare, Bon Jovi, FM, Aerosmith, Def Leppard, Kiss, John Norum, Green Day… But I also like ABBA, Emeli Sande and… well, lots of artists. And who have you actually seen live and where? Hm. See if I can resurrect my memories here. The first band I ever saw live was Modern Talking. I know, I know; put it down to teenage aberration. My brothers were mortified. That was in Essen, when I was twelve. I saw Europe a few more times in Germany but I can’t exactly recall where or when. Dare ~ saw them once (or twice? Not sure now) in Essen. We had a quick chat over a beer; they were the support act that first time and came wandering about when they were done. I also caught a drumstick in that show, I still have it to this day! FM ~ saw them… oooh lots of times. In Oberhausen and Munich (age 19) (me, not them! ); in Woking and London; in Cardiff… At the Oberhausen gig, I was lucky enough to blag an invitation backstage and chatted with the band until the bar closed. I got lots of autographs too but I can’t find them now. I think I banished them to a box in the attic a long time ago, swearing I was over and done with this rock star obsession. This was before I started writing, obviously. D’you reckon I should go and retrieve them? Speaking of ~ Have tix to see FM on tour in March! Splurged on the VIP package too so I’ll get to see the sound-check and attend the after-show event!!! Bon Jovi ~ saw them twice in Bristol, in 2008 and 2010. Shall I leave it there? Wow, that is quite a list Nicky. I love Dare. Their music has almost taken over the playlist I’ve set up for my current novel. And now for my final question – Sophie’s Run has been released and the final part of her adventure in the pipeline. What are your plans after this? I am going to write more Romance that Rocks Your World. I have two very different books in the hopper, featuring glamorous musicians of varying levels of success with different kind of love stories attached to them. I’m gonna have to throw a coin as to which one I’m going to write first! Thank you for joining me here in Bath Nicky and good luck with Sophie’s Run. It’s already on my TBR pile! Rock On! Nicky Wells writes fun and glamorous contemporary romance featuring a rock star and the girl next door. A signed author with U.S. publisher, Sapphire Star Publishing, Nicky is in the throes of publishing her Rock Star Romance Trilogy. Nicky loves rock music, dancing, and eating lobsters. When she’s not writing, Nicky is a wife, mother, and occasional teaching assistant. Visit Nicky on her blog where you can find articles, interviews, radio interviews and, of course, an ongoing update on her work in progress. You can also follow Nicky on Twitter and find her on Facebook. Nicky is a featured author on the innovative reader/author project, loveahappyending.com and has joined the Romantic Novelists’ Association. Nicky also has author pages at Sapphire Star Publishing, Amazon and, of course, Goodreads. Who says that the road towards true love is straight and even? Sophie is certainly discovering that it is anything but. So she has finally found the man of her dreams! Well… she knows who he is, even though she hasn’t actually quite met him yet. But she misses her opportunity, and then her life goes crazy. Rock star and ex-fiancé, Dan, keeps getting in the way of her new romance—even if he is just trying to be helpful. A fire, an impromptu mini-trip with Dan, and a dreaded wedding later, Sophie is still struggling to meet the love of her life. Then, just as she is getting it together with her perfect man, best friend Rachel commits an act of unspeakable betrayal. Sophie has had enough. Confused and distraught, she decides that it is time for radical change. Surprising herself and shocking her friends, she embarks on a secret journey and eventually gets her life back on track. My next Tea and Talk will be an author double bill – the lovely Michelle Bentham and my good friend Linn B Halton. I will be talking to these ladies on 16th and 17th March about writing and all sorts of other interesting things. Don’t miss it! Pingback: Come on Tour with Sophie and Dan! ~ Sophie’s Run Blog Tour | Romance That Rocks Your World! You’re on – Darren lives in North Wales now – and he’s on Twitter! Does he now??? Wow! A long way from Lincoln though. I have tweeted him a few times but…. *sigh* You know what it’s like when the mortals try to speak to the gods, haw haw haw! 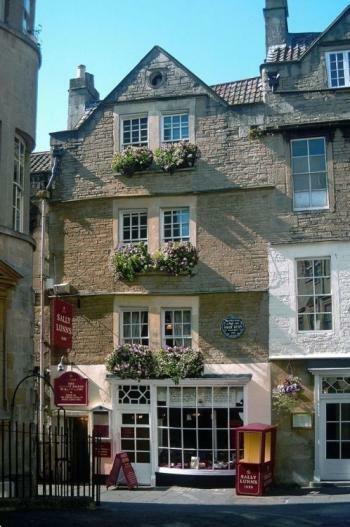 Sally Lunn’s is one of my fav tea shops – what a lovely place to meet up! Kit Domino and I actually did a couple of weeks ago – a lovely lunch and lots of book chat! Feel like I’m sitting here with you! Enjoyed this ladies, have a fab weekend! Nicky certainly does the business when it comes to interviews! Many thanks and you really do rock!